If you’ve ever driven down a mountain pass in British Columbia, you’ve likely looked up in awe at an off ramp rising up, up, up into… well, apparently nowhere. As the signs state, that is a runaway lane. In other words, it’s the road less travelled that you do not want to have to take. But, if you ever find yourself out of control down a hill, it’s the road you will be more than relieved to see. BC’s steep, winding, mountainous terrain can be challenging for any driver, but especially for heavily loaded commercial trucks. Still, downhill runaways are preventable. Descending steep grades at an appropriate speed, with properly functioning brakes, is an essential part of being a professional driver. A thorough pre-trip inspection gives you the most up-to-date information on the fitness of your vehicle. It’s also a good time to find out if an air line is likely to rupture when applying the brakes. 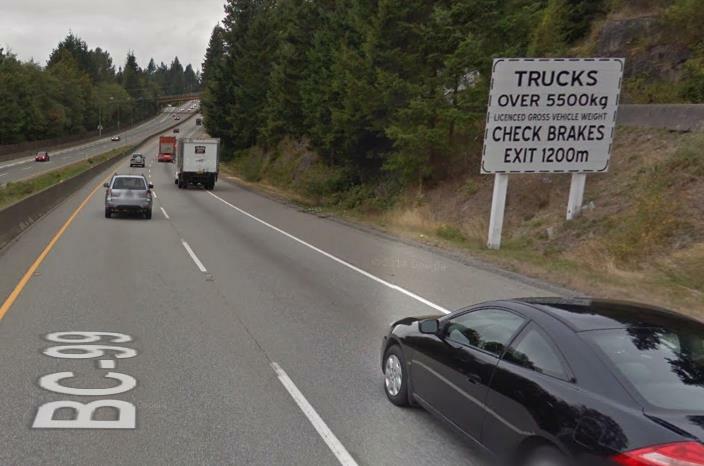 When professional drivers see brake check signs (like the one shown below) they know that it’s the law to adjust their brakes before driving down steep grades, including checking the “slack” at each brake chamber. That’s why there are brake check facilities located throughout the province. The brakes on a commercial vehicle can only accurately be checked by physically pulling (with the use of a pry bar) on each slack adjuster. Even self-adjusting slack adjusters need to be checked, and if necessary, adjusted. Check with a certified mechanic for the correct procedure. Plan your descent Information displayed on highway signs can help you plan your descent. 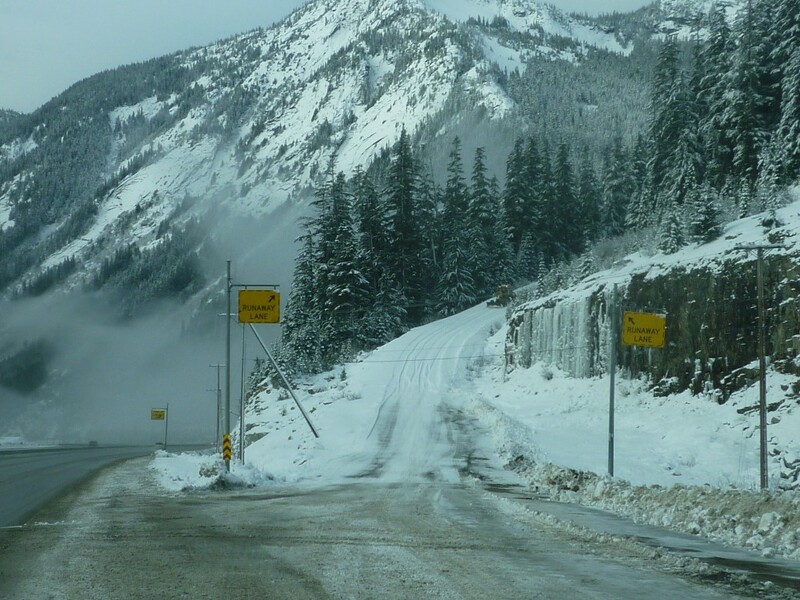 This includes information about the severity of the grade, the recommended speed to negotiate sharp curves, and upcoming runaway lanes.In BC, signs with dashed borders provide information for heavy truck operators. Select a speed that will let you travel down steep grades without having to brake continuously, which can cause overheating and braking power loss. An appropriate speed keeps the brakes ready to react when needed. Runaway lanes are a final safety measure for when you lose braking power. Consider using a runaway lane if applying the brakes has little or no effect on slowing the speed of your vehicle. If it feels like you have no brakes… don’t chance it – take action. It’s extremely important to make the decision to use a runaway lane before your vehicle reaches an unmanageable descent speed. Runaway lanes come in various lengths and grades, with different materials and features designed to stop out-of-control vehicles. Here are a couple types you can expect in BC. This is the type of runaway lane that leads a truck up a slope. It uses a combination of gravity and a bed of gravel to slow the truck down and keep it from sliding backwards. You’ll notice these runaway lanes on the Coquihalla, for example. This type of runaway lane relies on a cable netting system and/or a gravel bed to slow down the truck on either a horizontal or descending grade. You’ll notice one of these runaway lanes at the Horseshoe Bay Ferry Terminal, for example. It’s important to be familiar with runaway lanes, whether you’re a professional truck driver or an average driver. Brake loss is more common in commercial transport trucks, but it can happen to any vehicle. And, for obvious reasons, never park your vehicle in, or in front of, a runaway lane. Hopefully, you will never need to use these roads less travelled. Remember: safety starts with regular vehicle inspections and smart downhill driving. Follow the tips in this blog, and you should be left rolling just fine. I saw a lot of runaway lanes on my voyage from Lethbridge AB to the lower mainland of B.C. but one caught my attention along highway 3. This particular one has a really sharp turn to get into it since it’s partially blocked by a concrete based fencing type thing, I saw this somewhere between Salmo and Castlegar, just hate to be a trucker having to go into it with such a sharp turn in. I’ve passed your concerns along to the local district and the Commercial Vehicle Safety Enforcement (CVSE) branch. I was rather surprised by the location of the new runaway lane at Galena Bay on Highway 23 – at the top of the hill immediately after the brake check (the old runaway lane at the bottom is now the location for the outhouses!). Doesn’t really seem to be much use there. Great question. An engineering analysis and evaluation in 2013/2014 showed that an arrestor bed at the top of the hill would be the best location. The arrestor bed runaway lane location was chosen after an analysis of the grade from the ferry terminal to a point approximately 6 km’s to the south (towards Nakusp). The analysis reviewed a number of different scenarios of truck speeds and consequences. Firstly, if a truck lost its brakes in advance of the brake check or near the brake check, the truck will not be able to negotiate the horizontal curves on the way to the terminal and will exit the highway prior to reaching the terminal. 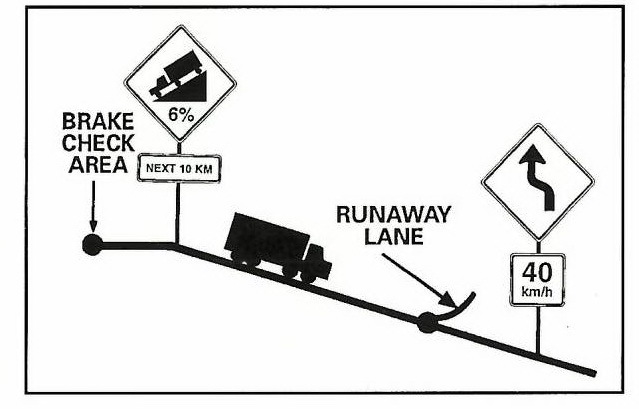 Secondly, if a truck uses the brake check, it will be able to safely proceed down the hill using its brakes. No brake fade should occur as the friction temperature will not get enough to cause brake fade or cause a loss of braking power. However, if such a condition was to occur, the truck would need to use the roadside ditch to slow down and avoid a collision with any queued traffic. For this reason, the clear zone concept has been applied to the highway with recoverable roadside slopes and breakaway lamp standards. The ministry did consider a secondary runway lane at the bottom of the hill near the terminal but considering the terminal area is busy with cars and people, combined with the topographical constraints, it is much safer to build a clear zone concept.